No need to wait for file proofs! Edit your own file directly in your browser or on a mobile device using the online editing software Corjl.com - no software required! **Edits must be made in Corjl - Files cannot be edited in any other software. Simple edits can be made on a mobile device, but more advanced customization should be done on a laptop or desktop computer. This is an instantly downloadable and editable file that you can personalize and edit at home. ► 5x7 *AND* 4x6 invitation templates. Can be downloaded as a single JPEG, PNF or PDF file. OR print 2 per page to save paper. ► 3.5x5 Book Request Card. Download as a single image or 4 per page. ►3.5x2 Diaper Raffle Card. Download as a single image or 10 per page. 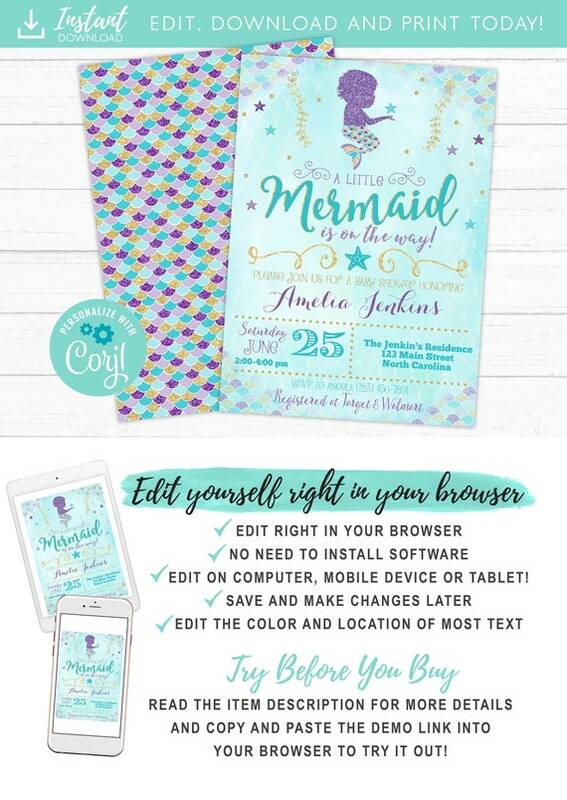 ✖ The wording "A little mermaid is on the way" is not editable. ✔ All other wording is editable. Change the font face, color, size or location! ✔ Ability to add more text to back. Can print with or without backside design. ✔ You can add your own images. Great option for the backside! ✔ Print at home, or send to the printer of your choice such as Staples, Office Max, Walmart, CVS, etc. ✔ Great for inviting guests paperless by sending in text, email or posting on social media. After purchasing the listing, you will receive a link in the email associated with your Etsy account to access your files (look for an email from Corjl). Check your spam/junk folders if you do not see it in your inbox. OR go to corjl.com and enter email and order number to gain access. To edit, simply replace the sample text with your own. Change text size, color, or font if you prefer! Download and save. PLEASE NOTE: Colors may vary between online viewing and your actual printed product. All computer monitors display color differently as well as all printers print differently. REFUNDS AND EXCHANGES: As items are digital in nature, we cannot offer a refund or an exchange on items already emailed. Thank-you for understanding.